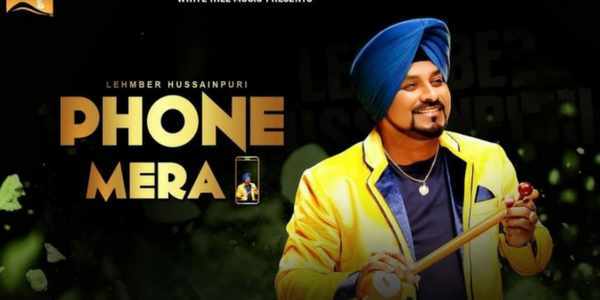 The king of bhangra song, Lehmber Hussainpuri has come up with his latest Punjabi song ‘Phone mera’. The song says – Jhuthi kehendi, sorry phone mera range ton bahar si. After a long gap, Lehmber Hussainpuri has released his track that has a lot of energy in it. Under the label of White Hills Productions, latest Punjabi track of Lehmber Hussainpuri is really a full-fledged entertainment package for all his fans. The song ‘Phone mera range ton bahar si’ has a perfect mixture of music and beats. One can’t resist tapping their feets ob the new song of Lehmber Hussainpuri ‘Phone mera’. The lyrics for the new track of Lehmber Hussainpuri has been penned by Binder Nawepindia. Phone mera Punjabi song starts with ‘Viber te Sharry de nal, Whatsapp de Garry de nal’. And the title line of Lehmber’s song is like ‘Gappi kehndi sorry phone mera range to bahar si’. The video of the song ‘Phone mera’ is a kind of comedy one, that shows one girl dating various guys and one of the guy reveals it on social media. After the Punjabi songs like ‘Hootar’, ‘Booliyan’, ’12 Boore Da’ and many more, Lehmber Hussainpuri has come up with a vivacious song that will surely make you shake your body in whatever mood you are. Have a look at the video and enjoy the mood of dance to the track. Click on the button and add another Punjabi song in the list of your party numbers. Phone mera by Lehmber Hussainpuri is surely killing it all. Sing along – Jhuthi kehendi, gappi kehendi, sorry phone mera, range ton bahar c.
Keep an eye on chandigarhmetro.com for the latest updates from Punjabi music industry.